your number one source for quality shop and erection drawings to ease your fabrication and on site erection of steel structures. We're committed to our clients success by working diligently to meet customers demands and provide the highest quality of finished projects in the industry. We strive for excellence and to be available to you when you need us. Our mission is to be more than just another company offering elite drafting services. Our goal is to be a valued business partner that work together on projects. Horrocks Detailing LLC works with engineering firms, steel fabrication shops and contractors. 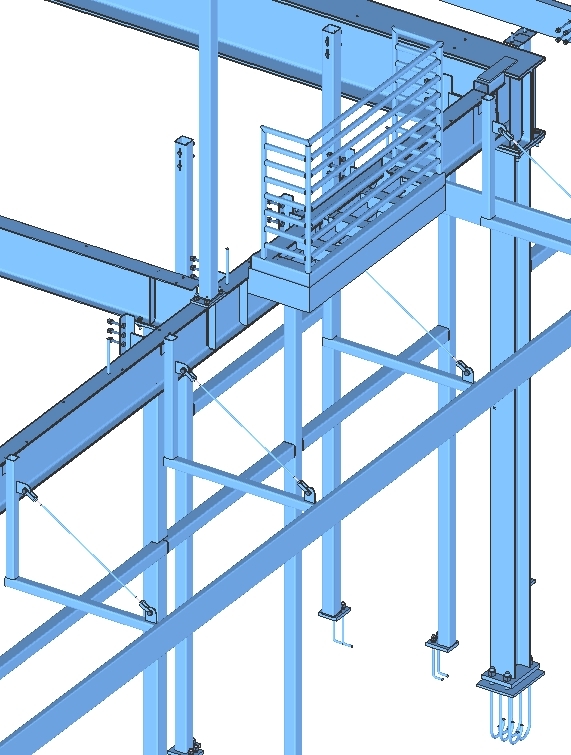 Our structural steel shop drawings are produced in either metric or imperial measures and in full compliance with AISC standards as well as with the standard steel detailing practices. Steel Detailing is the production of shop drawings for a steel fabricator. A steel fabricator is a company who provides, and sometimes installs, the steel framework for a construction project. A steel detailer's duty is to generate the drawings that the fabricator will use to cut and weld all the necessary members together. Steel Detailing is a specialist area of structural drafting. A Steel Detailing Company interprets architectural and structural engineering drawings to gain a thorough working knowledge of the overall design intent of a building or structure. Using this translated information, the Steel Detailing Company then produces an altogether different set of clear, unequivocal and accurate drawings for the purpose of steelwork fabrication. A steel detailer broadly generates the layout instructions to facilitate the installation and erection of the steel framework. A very generalized description of this relationship between fabricator and detailer can be described like this - the architect designs the look of the structure, and the engineer calculates the required sizes and locations of the steel to make the structure safe and strong. Finally, the steel detailer uses both sets of plans to provide detailed drawings with exact dimensions and lengths for each individual part that the welder and installer can actually use. Steel detailing companies primarily use 3D Modeling applications specifically designed for steel detailing. The detailer literally builds the project in 3D before producing detailed fabrication and erection drawings from the model. The use of this software, such as SDS/2 by Design Data, has allowed detailing jobs to be done more accurately than in the past and have also continued to update their software hoping to make it more efficient for the detailer to use. Horrocks Detailing LLC offers a variety of high quality and reliable steel detailing services using leading edge 3D technology to deliver the best products possible. We possess a comprehensive knowledge of 3D modeling to meet every challenge of steel detailing. We work on a variety of projects from simple buildings to complex, one-of-a-kind structures for many sectors including: commercial, industrial, residential, municipal and many more. Each project is approached with the mindset of exacting precision and attention to detail, complying with customer needs as well as with Industry Standards. We offer reliable steel detailing products and services with a customer-focused approach. Communication is very important to us, and we value customer involvement throughout each project. Horrocks Detailing LLC places significant importance on responding to our clients quickly. Regardless of project size or technical aspects, Horrocks Detailing LLC has the experience and technology to meet any requirement. We take pride in delivering clean, accurate drawings on schedule, and being available when our clients need us. No matter the job, we have the experience and technology to deliver. We produce shop drawings and layout instructions to facilitate the installation and erection of steel frameworks. This includes assembly drawings, erection plans, pre-detailing and design, shop drawings, single part drawings, and more. Clean, accurate files enable the steel fabricator to cut and drill to exact specifications. These modeling files enable contractors, architects, engineers, and other professionals to address issues early in the process – saving cost and time. From start to finish, your project has every advantage - a dedicated detailer who takes pride in his work along with continually updated state-of-the-art software. With these two advantages, we are sure that you will acknowledge the quality of work accomplished by Horrocks Detailing LLC. Anchor rod placement and embeds are completed. The drawings that reflect all the steel to be embedded in concrete are produced within a few days of our receiving the contract. The drawings that reflect all the steel to be embedded in concrete or masonry walls are produced soon after. Your steel model is constructed. We create your 3D model by adding all members and applying connections. Our ability to rotate and manipulate the visual perspective of your structure as we’re building your model increases the quality of your product. We are able to see mistakes that otherwise might be missed without the use of this highly interactive software tool. In addition to its visual advantage, it maximizes speed and efficiency in our hands when changes are needed. At this step also it is critical that we have the most current set of design drawings to insure an accurate model. RFI's will also be sent out at this time. 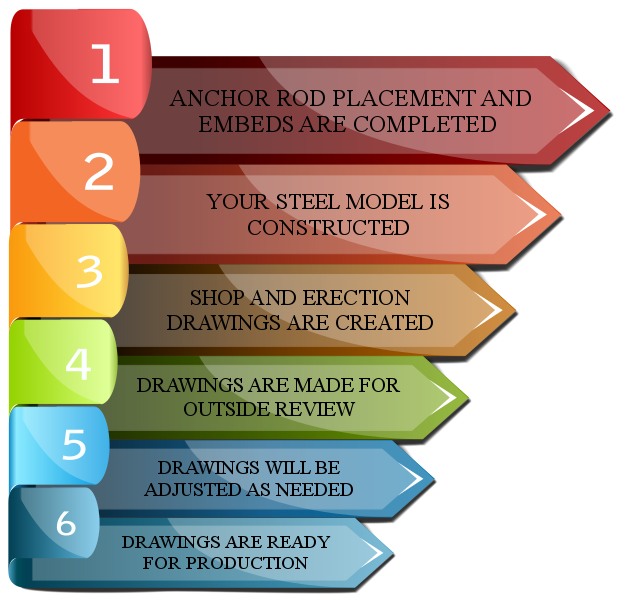 Shop and erection drawings are created. Your project’s model then moves to the drawing phase where all necessary fabrication and erection drawings are detailed in 2D paper space. All fabrication drawings will have all section cuts needed and will be fully dimensioned. Erection plans will show placement of all steel along with sectional views showing such members as vertical bracing. We will also provide an isometric view which will help the erector to visualize the structure before he even starts. Horrocks Detailing LLC prides itself on extremely clean, and easy to read fabrication and erection drawings, all computer generated information that is not required for approval, fabrication, or erection is removed. At this point your drawings are made available for outside review (fabricator, contractor, owner’s representative, architect, engineer). At this point, it is crucial that all questions noted on the drawings are answered by the appropriate approver. Once contributors have added their notes/comments/answers and all RFI's have been responded to, your drawings will be adjusted as needed. Your drawings are ready for production. Throughout this process, your team has access to drawings 24/7 including 3-D models if desired. Building Information Models (BIM) are available upon request. Please contact us if we can be of assistance with your next project. We handle projects of all sizes and complexity with a commitment to Innovation, Quality, & Service. We pride ourselves on being an integral part of the team during the demands of challenging projects and building lasting relationships into the Future. 2018 © Horrocks Detailing LLC. All Rights Reserved.